As we head into September, we bring news of Bentley's fastest-ever Flying Spur, the first spy shots of Toyota's new Supra, and the reveal of Jaguar's new Formula E car! 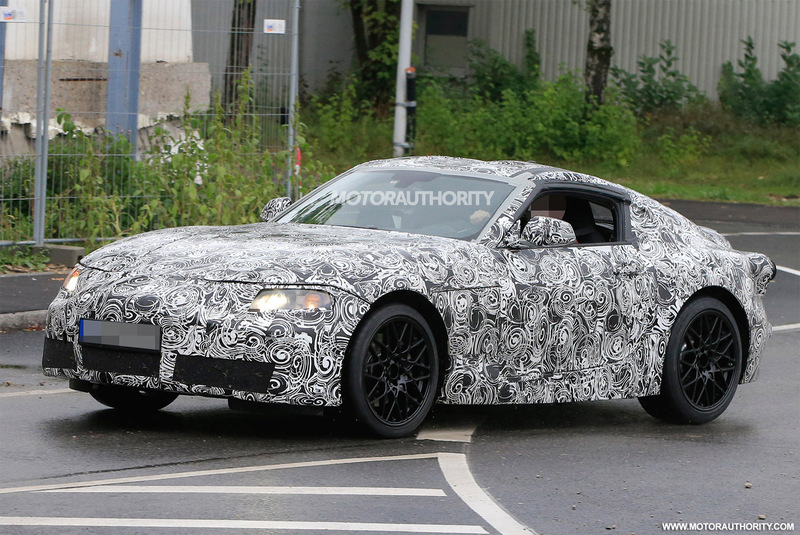 Toyota's next-generation Supra has been spotted undergoing testing for the first time. The Supra stopped production in 2002 and it seemed as though it was the end for the iconic Japanese sports car, but after a lot of rumours we now have proof that the car is definitely happening. A few months ago we brought you the news that BMW and Toyota had teamed up to help develop a Z5 and new Supra for each of their brands. So far we've seen spy shots of the Z5, but now we have the Supra too. Whilst most were expecting the car to be based on the Toyota FT-1 supercar, it looks as though it's not the case. Whilst the shape is similar, the aggressive and unique design hasn't been carried over with a far more toned-down look. No information is known on what might power to new Supra as of yet, but rumours suggest it could be a hybrid engine with technology taken from their Le Mans race cars. As always we'll bring you more as and when we get it! The all-electric Jaguar I-TYPE has been unveiled ahead of the start of the Formula E season. Jaguar Racing announced earlier this year that after 12 years out, they would be returning to racing in the shape of the all-electric Formula E competition. Well, ahead of the first race on 9th October we can now see the race car that they'll be using as well as the two drivers that'll be operating it and putting it through it's paces; British driver Adam Carroll and New Zealander Mitch Evans. The I-TYPE itself sports a very cool, tech-like livery with straight, vibrant lines used across the car. The look goes really well with their title sponsor Panasonic, which appears in large lettering on the front of the car and its wings. Jaguar will be hoping their success in the competition is as good as the car's styling and design, as they look to build a racing team that represents the brand name strongly. The latest addition to Bentley's Flying Spur lineup is this: the W12 S.
Bentley has decided to take their Flying Spur and drop a 6.0-litre twin-turbo W12 engine into it, making it their latest ever four-door car. The figures are just as insane as you'd expect, with 626 bhp and 605 lb ft of torque being pushed from its engine making it capable of 0-62 mph in just 4.2 seconds and a top speed of 202 mph. Engine aside, the car also receives retuned suspension and modified damper settings to make it the best handling Flying Spur to date. Exterior changes include gloss black touches, gloss black 12-inch alloys, tinted front and rear lights, and some other small but cool changes on the inside too. The cost of the car is unknown yet, but with a 'normal' Flying Spur W12 costing £154,000, you'd imagine this is more towards the £170,000 mark. An all-new five-door coupe version of Audi's A5 has been revealed. The latest A5 was revealed in June and it looks though Audi are continuing to expand their lineup with this new five-door Sportback model. In terms of styling, the car doesn't differ much from the usual two-door A5, with the obvious change being its shape as a result of the extra doors. This gives the car a more rounded, swooping rear-end - similar to the A4 saloon. Under the hood, the engine lineup is the same too, with a range of four and six-cylinder petrol and diesel engines ranging from 187 bhp to 282 bhp. There is also an S5 equivalent available too, sporting the same 349 bhp 3.0-litre V6 turbo as the two-door version. The A5 Sportback will make its debut at the Paris Motor Show next month, with prices starting at just under £32,000 for a 2017 release. The new Renault Megane RS has been spied undergoing testing. For those hoping that the spy shots might reveal how the car will look, then you'll probably be disappointed. The car spotted is in fact a test mule built on the current Megane GT, however there is enough to suggest that this is most definitely the new RS. The most obvious is the new central twin-exhaust, as the Megane GT has them separated on each side of the bumper as you can see. Whilst details remain scarce, the car is expected to have around 300 bhp available and a smart new rear-wheel steering system. That combined with torque vectoring and clever computer mechanics will likely make this the best handling Megane ever. The new RS will continue its development way into next year, with 2018 looking like the year that it'll become officially available.